Were you about to make a pie for this weekend? Stop. I think you should join me in abandoning Team Pie for Team Galette; you won’t regret it. It’s not like we haven’t had our share of exceptional vegetable galettes, but save a nectarine version in the archives and a cherry-almond riff in the book, I usually defaulted to pie when it came to fruit, round, slabbed or cookie-ed. But last week, when we had an excess of blueberries on our hand because someone (cough) cannot control herself when anything first graces the Greenmarkets, it all felt like so much work — all of that dough, sugar, crimping and weaving and trimming, baking time, plus I have no idea where my pie dishes are, they’re probably being used as a play-doh receptacle somewhere. A galette would never do this to you. Galettes are your friend. Requiring less of everything, they come together in all of 15 minutes and take 30 to bake, which means you can totally wait until the last minute to make one, as you were going to anyway. They don’t care if you make them round or square — whatever shape the dough stretches out into will do. But that doesn’t mean someone (cough) didn’t get carried away trying to put a July 4th spin on hers. I won’t lie: it was kinda fun, as should be expected when your day “job” requires you bust out the craft supplies (scissors, paper and an notebook to doodle in) to figure out how to fold a flat shape into a fruit vessel of a star. [Spoiler: A pentagon does the trick.] Working well outside my graphic design comfort zone (I peaked in Microsoft Paint), I attempted to make a template that will walk you through the same, although your dough will allow you to make a galette much larger than can be printed on a sheet of office paper. What you put inside is up to you. I doubled the recipe (which yields one) to make a blue one with blueberries (though blackberries would be wonderful here too) and a red one with a mix of raspberries and cherries (strawberries and currants would be excellent). If you’re going for the whole patriotic look, you could make a white one with peeled white peaches and apples or pears, or white raspberries or cherries if you can get them. Or you could just top your red and blue berry galettes with a scoop of vanilla ice cream. Which is what we did. As if you ever had to ask. I added some ricotta to the dough, which gave a nice subtle flavor, but you could replace that easily with yogurt or sour cream. Leakage is almost inevitable when making galettes but you shouldn’t sweat it because I’m convinced that it’s more distressing for the baker (who knows exactly how much jammy deliciousness has been lost) than anyone eating a wedge (it will taste like nothing is missing at all). Let it gooooo, I say, as all the preschoolers sing. Here’s the PDF template I made to help you form a star shape, if desired. As should be abundantly evident, I’m no graphic designer, but it will hopefully give you a start. 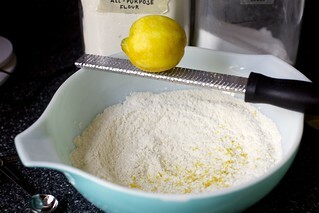 Make dough: Whisk the flour, salt, sugar and zest together in the bottom of a large bowl. Work the butter into the flour with your fingertips or a pastry blender until mixture resembles a coarse meal and the largest bits of butter are the size of tiny peas. 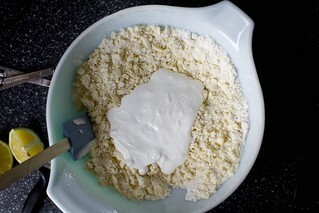 Stir ricotta and 3 tablespoons water together in a small dish and pour into butter-flour mixture. Stir together with a flexible spatula as best as you can, then use your hands to knead the mixture into a rough, craggy ball. 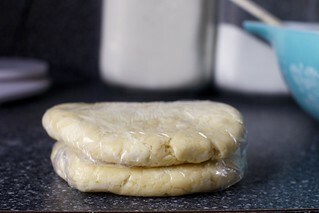 Wrap in plastic and flatten into a disc. Chill in the fridge for 1 hour or up to 48 hours, or you can quick-firm this in the freezer for 15 minutes. Assemble galette: Heat oven to 400 degrees. 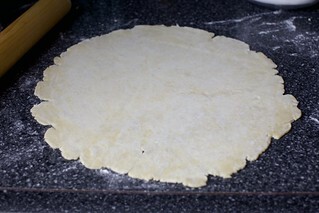 On a floured counter, roll the dough out into a large round-ish shape, about 14 to 15 inches across. Whisk egg yolk and water together and brush over exposed crust. Sprinkle with coarse sugar. Leah — Make the galettes. I mean, the flag cake is such a showstopper, but I made it three years in a row and am happy for a break. Leave them wanting more! This is my first 4th of July as an expat in the UK, but I can’t wait to give this a shot anyway! Thanks for the idea! Such beautiful galettes! I once made this galette with ricotta & berry filling http://www.growntocook.com/?p=1489 but have not thought of adding ricotta to the dough – Will definitely try that! I *love* the template. So helpful! Get out of my head! :) I was just thinking about making berry galettes with the batch of ricotta I messed up this week (too dry). And since the 4th looks like a rainout here in the NE (boo! ), I’d say it’s a perfect day for making and eating all the galettes! I may need to do this with the next batch of cherries I pick! Ooooh, love it. 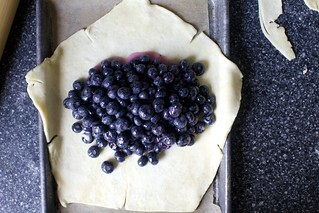 I have frozen blueberries from earlier this summer – would they be too watery for a galette? LOVE galettes. I’m always making the ones from Barefoot Contessa, and your savory one from your cookbook is AMAZING. Thanks! Oh my goodness. This is so brilliant! Way to do the geometry puzzle for us. If our 4th plans wind up working out, I think I’ll try to make this. If they don’t work out… maybe I’ll still try to make this. Healthier than your double chocolate banana bread, which I’m currently eating (http://girlnamedallyn.wordpress.com/2014/07/01/double-chocolate-banana-bread/)./ SO GOOD! If needed for the patriotic look, white whipped cream, would be tasty…that is if you are traveling and can not bring the ice cream. 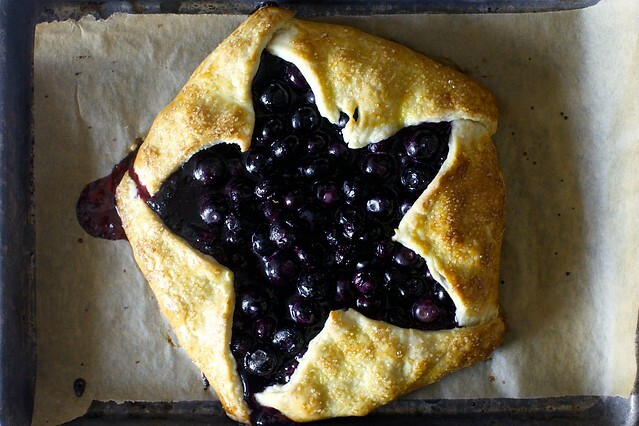 Such a great idea…folding the pastry to look like a star topped galette. Happy Independence Day to all! Yum! The galettes look perfect for the Fourth of July! This is SOOOO perfect!! I need to make this with strawberries!!! Hi! Looks so yummy and the recipe seems accessible to new bakers like me!- Can I substitute something in place of cornstarch? Thanks! That is SO CUTE! I love the star especially. HI! This recipe looks great and accessible to a new baker like myself. Can I substitute something in place of the cornstarch? Thanks! Adira — Arrowroot powder and potato starch are the usual cornstarch replacements; I think arrowroot works a bit better. These are so gorgeous. ‘Merica! Just gorgeous – that pastry looks uttelry delicious – I guess these would be good with a flaky pastry too do you reckon? I LOVE THEM. I am the kind of person who gets sick of “holiday-themed” stuff on food blogs, but you have never failed to keep them classy. Galettes are the best. Jen — You could use shortening, margarine and/or coconut oil (solidified) in the crust, and instead of using ricotta and water, use just 1/4 cup cold water. That will make is more like my basic pie dough. The egg wash is just for gloss and you can skip it. Deb, do you think these would last well if I wrapped them and kept them chilled? I’m camping this weekend and would love to be a superstar and pull these out of my cooler the first night (and maybe warm them on the campfire? Too crazy?)! Katie — You can keep galettes at room temperature or in the fridge (as I do, so they’ll last longer), so yes, cold is fine. I am sure you can toast up a slice on the fire, something that sounds so good it might make me reconsider my camping aversion. Hah, just thinking that if you wanted to do a vegetable galette instead you could do one with tomatoes and/or red pepper, a second with eggplant or purple potatoes, and a third with some vegetable (asparagus with caramelized onions?) under a tasty layer of white cheese. Of course, I am all in favor of the sweet version with fruit that you have done so well. Thanks! JP — Definitely! Did a vegetable one here on top of a layer of ricotta, with zucchini. You can definitely use the same shape. Those look so awesome! Nice work on the star, how on earth did you ever figure that out? I would’ve given up. Officially on team galette. Adorable! Love, love, love the stars… who knew galettes could be so fancy? This is amazing. The shaping is genius. I love a galette/crostada thanks for the inspiration! I feel like I had the same reaction at my grocery store as you did at the market — OMG CHERRIES ARE HERE I NEED TO BUY ALL OF THEMMMMM. Oh, so lovely. I’m always -about- to make a pie and then a gallette wins. Doesn’t it feel more crowd-friendly? You don’t have to worry about people pulling slices from a deep dish. I was wondering if you ever tried using a bit of cornmeal in this dough (maybe for the 1/4 c)? I have some from the U Sq. market that is fabulous. Thanks! This is SO neat!! I started making galettes a few years back (with your nectarine recipe, actually! ), and am always so pleased with how simple they are to make. I never thought to make a specific shape with the opening, though – this is hands down my favorite Fourth of July themed dessert I’ve seen this year!! Very clever! Could also be used for Christmas parties. I love this and happen to have ricotta in my refrigerator. I was going to make lasagna, but it’s been too hot to make something that heavy. A berry galette? Sounds perfect! Kara — Definitely. I think minis would be cute. These look amazing! I am tempted to forgo my usual July 4th dessert for this instead, but don’t know. I usually make a red, white & blueberry trifle that’s been pretty popular. Bonus; if I make the cake ahead all I need to do is assembly on the day of. Maybe I’ll have to do both! The template is awesome and above and beyond the call of duty. Nice job! I’d send you to the front of the class, but you’re already there anyway. Happy 4th! Your Microsoft Paint references always remind me of one of my favorite posts of yours from way back with the lattice-top pie diagrams :) That’s some impressive Paint work! Perfect! My son and husband picked fresh blueberries today. 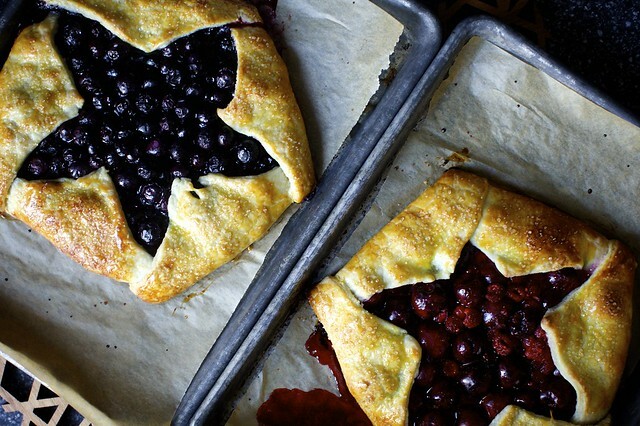 Such pretty galettes, love this idea for the 4th! For minis – how many do you think you could make per batch? Would the cooking time change? Well, this looks delicious. But: is that a “Frozen” reference I caught? “Let it gooooooo”, lol, indeed. Kate — It’s been stuck in my head for 2 months, at least. Send help. Medha — Half-half would be just fine. I am right up front with you supporting galettes!! They’re so flipping good and waaaaay easier. This recipe is great! This is so pretty! I really like how fresh the berries look. I have both sour cream and ricotta in my fridge, but only a small amount of each… would it be terrible to go half ricotta/half sour cream? Beautiful galettes–I especially like the star pattern, so festive! I’ve never made a galette, buy may just have to give it a try! Look great! I’m going to try with gooseberries, elderflower and maybe some ground almond in the dough? thanks Deb! How pretty is that star! Way better than pie in my book. Happy 4th of July!! Can’t wait to try this! Does the fat content of the ricotta matter or will part-skim work? Nikki — Part skim is just fine. Adding a bit of dairy (sour cream or the like) to the crust is just to soften it and deepen the flavor. Well, bless your sweet heart! My busy little mind was going in the same direction just a few days ago. I am chronically ill (Lyme Disease) and am inundated with black raspberries right now. They just keep coming, and coming, and coming. . . . (Wish I could send you some!) I was so wanting to make a pie, but so little time, so little energy; and then, and then, here comes the complete instructions for just the freeform-crusted thing my mind was conjuring up! You are the quintessential Fourth of July girl–you gave me “freedom from pies”! This is (one of the reasons) why I love you–zest from HALF a lemon, juice from HALF a lemon. You are so efficient with your ingredients, and make recipes so easy to multiply. Love your blog and love Love LOVE this recipe – pix are gorgeous and the template is a nice added touch! Hooray! I made an obnoxious flag cake last year and was thinking that I would do some boring star shaped cookies this year. But THIS is perfect!!! Thank you, Queen Deb! Would this work made in a pie dish instead of on a cookie sheet? I have a beautiful red Emile Henry pie dish that is just so All-American and I think the blueberry one would look great in this. Would it cook the crust right or end up doughy? It would bake up just fine in a pie dish. It helps keep in leaks, too. :( I totally expected the filling to have ricotta… not just the pastry, so thank you for including your vegetable/zucchini version! I’m going to morph that veggie recipe into a berry version with sweetened ricotta vs. my usual almond filling base. Love this. Cherries are under two dollars a pound at my local market. Between this recipe and the Dutch Baby I may have to go buy a pitter. Excellent, Smithers! I did just look at the next bag of cherries & wonder what to do, before we eat them all. Plus the dwindling box of strawberries. Beauty and Art! This looks easier and more forgiving than making a pie. Deb – Do you think substituting tapioca for the cornstarch would work here? I love how the tapioca works in your strawberry-rhubarb pie recipe and am wondering if it would work well for the galette — or perhaps you’ve used cornstarch for a specific reason…? In any event, I can’t wait to try this recipe! WTAAC — Yes, tapioca would be just fine here. I defaulted to cornstarch because… it was in the closest cabinet when I was making this. Seriously. Deb, all of your galettes over the years have totally transformed me from a pie lover to a galette maker. These are gorgeous and undoubtedly delicious too! The star is GENIUS. Well done! Deb, I didn’t see an answer to the “would frozen berries work?” comment. I too, have some frozen blueberries from last year. Do you think I’d need to adjust anything (cook filling a little beforehand?). These look perfect for the 4th! Frozen berries — Whoops, missed the question. I think they’d work. Try to drain them off a bit if they’re defrosted. That said, I think you can mix it up while they’re still frozen, you’ll just need a few extra minutes baking time. Well, I am going to have to talk Husband down off the pie ledge… he’s determined to make not one but TWO pies tomorrow. Maybe I can sell him on these instead because they are gorgeous! Happy Fourth, Smitteners! Oh my goodness these look fabulous! Happy 4th! very pretty…cute with the star & so quick and easy. Speaking of which, a picture of your Nectarine Galette was the headliner in our food section of the newspaper yesterday, along with a mention of your website with 800+ recipes in your index. The recipe was included. Many of your recipes will be enjoyed by my house guests this weekend. I found a bag of really great smelling nectarines last night…just found your nectarine galette recipe today. That’s what’s for breakfast tomorrow morning…yea!!! Sit outside, enjoy the galette, drink coffee with a little booze in it, and light smoke bombs for entertainment…all the fun of fireworks, without the noise, so the dogs won’t get jumpy (yes, we live in the country, and we’ve had lots of rain recently, so it’s ok). Have a great weekend!! Just made these today; they look and taste amazing! My berries were extra juicy so I added a layer of ground almonds in the galette before adding the berries and it sopped up the extra juice perfectly. The crust wasn’t soggy at all. So. . . really? Really? Are mine going to be pretty like this? Or is this a trick of the skilled and highly gifted? Just checking before I commit. If you say yes, I’m soooo in. Jennifer — I think it will be! From what I’ve seen in photos tagged on Instagram and social media for me, the trick is definitely to make sure all of the points that you fold in are folded toward an imaginary point in the center, i.e. it’s the angle of the points that forms the star. These are so beautiful! I love the star shape! Nice recipe! Are cherries and raspberries OK to use?? curiosity — Not only were cherries and rasberries, we’ve since decided that they might be our new favorite baked summer fruit combination, we love the way they played off each other. In short: the red galette was gone long before the blue! I just made minis of these. I doubled the dough recipe, swapping the ricotta for a sour cream and egg mixture (I thought this would help with pliability–it did) and separated it into eight rounds. 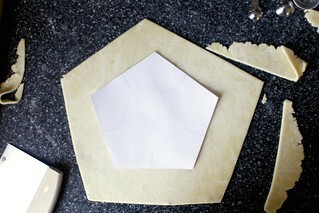 I printed the template at half size, and was able to cut two hexagons from each round after rolling out. I made one recipe of blueberry filling and one of strawberry, and filled half the little guys with blueberry, half with strawberry, about a soup spoon of filling in each. I had minimal leakage, but a lot of extra filling, so I would maybe make just 1.5 recipe of filling in the future. They’re super cute and perfect as hand-pies! Just made this last night. Just like CS said above, mine came out more “rustic” – read “less perfect.” I was still happy with the results and would definitely give this another shot now that I know the ropes a bit. Can’t wait to try it. Off to get berries. FYI, O Cafe on 6th Ave and 12th st. makes a fabulous apple tarragon galette in-house. Do you make the dough by hand, rather than using a food processor for a texture/taste reason or is it personal preference? And are you a fan of using cold vodka as a replacement for some of the cold water when making pie doughs? In the middle of making two galettes, can’t wait to eat them! Karen — Oh, hi Karen! 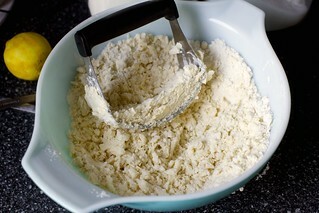 I personally prefer using a pastry blender because it feels easier to me (I make the dough and the filling in a single bowl, rather than busting out the FP, which, not that I’ve counted or anything, but has FIVE parts to wash) and because it’s very easy to over-blend the butter in a machine. If I do use a FP for this, I only use it to break up the butter; if you get the pieces to a good size and then blend in the liquid(s), the pieces end up overblended. So, I’d use it for the butter step, turn the flour-butter mixture out into a bowl and mix in the liquid(s), and that just doesn’t feel worth dirtying those extra dishes for. It’s like you knew I’d wait until the last minute to decide, er, be inspired that is, to make a 4th of July dessert! My blue galette is now in the oven and the day is saved. I am a total galette cheerleader myself! I have often joked that my favorite thing about making a pie is making a galette with the leftover crust. My go-to is sliced pears on a bed of ricotta with a touch of brown sugar, ginger and vanilla. This looks amazing and I’m planning on three types of berries. However, all I have is salted butter? Can I leave out the salt and use this butter instead? Kiley — Salted butter would be tasty here; just don’t add any salt to the dough, as you said. Just made these – I don’t think the little one-inch slice in the center of each side of the pentagon is necessary, and may contribute a bit to leakage. I used the leftover pieces of pastry to make a pastry sun, because it is raining nonstop here in Boston! Ethel — Glad you enjoyed. The notch in the side creates an overlap for the outer corners that helps hold the filling in. Without it, the corners would be at the same level as the tray and all of the filling would rush out. I made this! And as a point of reference, I am impossibly, sadly hopeless at pies, cake and even cupcakes. But this? This was fabulous. I only had Rainier cherries and cream cheese and still created a great dessert. In fact, there was no leaking; not exactly sure why, but who cares, right? The dough is fabulous, so wonderfully buttery, and now I’m eying all the fruit in my kitchen because surely apples, plums and/or blueberries could grace our neighbor’s birthday table tomorrow. Thank you! I made this with strawberries and raspberries and screwed up several steps, so in the unlikely event that someone who didn’t read the recipe carefully (like me) is reading the comments, I offer the following notes. It wasn’t completely clear to me that the filling wasn’t to be mixed until after the pastry was rolled out, so I mixed mine before and that made the filling watery when I put it in the pastry, which I think contributed to an underdone crust. In addition, it is very important to transfer the pastry to the parchment paper BEFORE you add the filling, because adding the filling and folding it and then moving it to the parchment is something of a disaster. Hence mine did not look nearly as nice as the ones in the photos, which was not the recipe’s fault. Also, your pentagon needs to have sides that are all the same length or your star will not look right. Deb, I made this today and was left with one tiny piece remaining after our family swooped in on it. By far, the best crust I’ve ever made. Thank you so much! Lovely, lovely recipe! Made it tonight with blueberries (didn’t fuss with the star), and it turned out beautifully. Thank you, Deb. Holy COW! This works! And I don’t just mean it works. I mean it is amazingly awesome and delicious, and my NINE year old just made it and it works! Good grief! In fact, I felt so guilty for polishing off the leftovers for my own personal selfish breakfast that I made more this morning, just to soothe my conscience. Oh, and thought I should mention this tidbit, too. We made two of these, one in the star shape, which turned out beautiful, and one in a tart pan because I did not believe it would work. Sorry. The one I put in the tart pan seemed low on filling, and since it had the extra support on the sides, I decided to double the filling. This worked out very well,and would not have held if it had not had the extra sides. 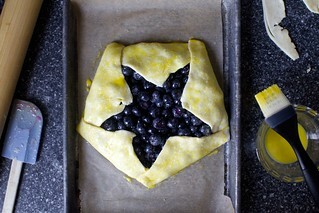 The star shape tart was perfectly suited to the amount of filling called for in the recipe. Nice decorative touch, I’d probably have skipped right over this if it weren’t for the stars angle (no pun intended). Instead I’ll have one very content household on my hands for days! Super easy. Very tasty. Thanks for the easy pastry recipe! I made this last night and it’s the first time I’ve made something with homemade crust that I would serve to friends. I’ve been on a rhubarb kick lately so I used rhubarb strawberries, blackberries and blueberries and it came out perfect. Thanks for the recipe! After reading someone post about making your nectarine galette I had to try one since I had four lovely nectarines sitting on my counter. I put my marble rolling pin in the freezer while the dough was chilling in the fridge. The rolling pin sweat some when it came out of the freezer but that only made the flour stick to it better. I used my lefse pastry board and everything worked really well. Nothing, and I mean nothing stuck, tore or had to be rerolled. I used the pastry recipe with the nectarine galette instead of the ricotta one here but would never have tried either had I not been reading all the comments. Thanks again for another successful recipe from Smitten Kitchen. I made this on the 4th between the parade and the kick-off of evening festivities, took it to a friend who just had joint surgery, and back home to settle down the puppy from fireworks! I used home grown blueberries and meyer lemon. Needless to say, I did not take time to chill anything, and it worked out fine! My friend asked for the recipe. Thanks for this easy and beautiful recipe. I made the cherry for the holiday. So good! I used the sour cream in the crust and didn’t use the water at all. (I have a similar recipe for a sour cream crust and it only uses 2 Tbsp’s of sour cream and no water and is my go-to for all custard pies.) I loved the cut-out that formed the star. You made this the perfect non-gaudy dessert for July 4! Thanks! I made these for a pre-fireworks potluck and they were almost as pretty as yours! Thank you for the recipe and the inspiration. I made two smaller blueberry galettes and one larger strawberry rhubarb galette. People oohed and aahed! holy, is this ever an impressive looking treat! i made one with fresh blueberries and one with jarred sour cherries and fresh red currents. however, as an inexperienced baker of pies and pastries, i completely forgot that over-kneading or over-rolling dough is a very. bad. thing. i was so determined to get the shape of dough right that i didn’t even think of how that was toughening up the pastry. that being said, it was still quite tasty and well-received! so tip to those not familiar with pastry – don’t overwork the dough! I love pie, but I think I am going to move from team pie to team galettes. These are prime example. Anything with fruit gets my attention as well as anything with ricotta. You had me with the mere title. We made the blueberry galette for the 4th and topped it with some homemade Roasted Strawberry Buttermilk Ice Cream. Absolutely delicious! Thanks for this perfect recipe! I made this to take to a party this weekend, but it didn’t make it! So delicious and easy! I made both kinds for my July 4th party this weekend. They came out wonderfully! I don’t bake often, but the galettes were very easy. I did add an extra handful of fruit to each because they seemed a little light on filling…maybe because I didn’t trim to star shape, so the crust was larger. Ohhh girl these look so tempting!! Cherries and blueberries packed into delicious buttery crust!! Breakfast fixed for tomorrow! I love making these. They are beautiful, delicious and simple. Your addition of ricotta is genius. I cant wait to try. I made mine with cherries/white peaches and blueberries/blackberries. Turned out great! I also did not make them into pretty stars, but put cutouts in the center. Great crust! Beautiful! This is the last push I needed to make one! This is not my first post. I’m the one who lives full time in an RV. Your recipes are always the best. Made the “red galette” with strawberries and one cut up peach. Since I don’t like to make pie crust, I used a store bought crust, covered the bottom with plain yougart and a teaspoon of almond extract. Delicious! Also made your mediterranean pepper salad this week. Will be making this salad again for a pot luck. From your cookbook I made your peach and sour cream pancakes (not the first time for these). I doubled the batter using 8 oz. of sour cream,5 oz. of plain yougart and some milk. Delicious, my husband really loved them! Thanks again for all your hard work. This galette recipe was wonderful. I was going to make a blueberry pie for my indoor picnic on the 4th, but when I saw your recipe, I knew it would be far easier. I could not make the star shape, but a lopsided circle worked — and then I put fresh raspberries around the sides. Everyone loved it! Thank you for such great recipes! Now I’m really feeling ashamed – my efforts in folding anything around fruit always ends looking more like a pancake smeared with fruit – still yum though. As ever you’ve inspired me to run the gauntlet of my husbands comments and have a go at this. There’s always therapy if it goes horribly wrong again… Thanks for sharing what looks like another divine fruity treat. Hey Deb, I made your Zucchini and Ricotta Galette (which I can not pronounce)and it was the best thing I have ever had or dang close to it. Is there a way to incorporate your Galette dough and make “pizza’. Thank you for your most wonderful, creative recipes. These are beautiful! I made a savory version of this over the weekend that involved roasted heirloom tomatoes and goat cheese. Hmmm. Maybe this weekend. Was busy bringing man-beverages to my grill-master last weekend as he dutifully tended to a hickory-smoked pork shoulder. Loving the “star shape”. These look wonderful. Ann again from #128. When I made the pancakes I used half AP flour and half whole wheat. Delicious, cherry was favorite over blue version. Just made the blueberry version of this. Delicious! Tasted like my favorite blueberry lemon ricotta pancakes in pie form! We just made this with blueberry filling and it was delicious. But, I was wondering, did you figure out a way to transfer this yumminess to a serving piece? I was unable to do so. Nikki — You couldn’t slide a spatula around underneath the galette? I guess if you let it cool in the pan, any spills “set” and stick more to the parchment paper. I usually move it when it’s still warm. It might have been helpful to know that, huh? I grew up with my mother making something similar to this as it’s a typically northern English style dessert that uses ‘leftovers’ ie: fruit, jam, jellies, sweet treats etc. that you can just shove into some also leftover pastry. Deb! Thank you for helping me find a wonderfully tasty way to use up all my cherries and blueberries! And your posts always make me smile :-) I was wondering how long you think this will keep in the fridge? Also would it freeze well? Thanks! I just made this galette with a blueberry filling and it turned out wonderfully. This will go into my dessert roster, certain to be enjoyed many more times. Thank you for the recipe! Well this post just inspired me to make my first ever pasty/pie/galette dough, so thank you for that! I used sour cream instead of ricotta, and the dough seemed too wet. I chilled the dough for about 3 hours, and after about 5 seconds of it being out the fridge it got extremely sticky and started to stick to the rolling pin and break apart. It also stuck to my floured work surface. I barely got it on the baking sheet in one piece! What causes this? Did I not incorporate the butter enough? Did it need to rest in the fridge overnight? Maybe my kitchen was too hot (this is July in Washington DC after all… oh and I have no A/C in my kitchen). Anyway, the galette leaked all over the place (thank you parchment for saving my baking pans) but I have to tell you that despite everything, it tasted DELICIOUS. I used one cup blueberries and 2 chopped up peaches for the filling, plus a pinch of cinnamon. It was so, so good. Good enough to make another dough attempt, but with less liquid on a day that’s not so hot and humid. Those pictures just grabbed me! I made these today. I never want to make pie again. Made this with cherry/strawberry, absolutely delicious! Another winner, Deb! Used a smaller amount of sugar and didn’t spoon much on top — the blueberries were tart, and it didn’t come out very sweet at all. This was ok, it just meant it was less “sumptuous dessert food” and more “I totally would not be embarrassed to eat this for breakfast.” I was glad it wasn’t too sweet, because it was a very dessert-heavy picnic. How is this a galette and not a tart? sally — It could be either or both. Galettes are usually free-form desserts, tarts have open fillings. I made these for the 4th. Raspberry/Strawberry and Blue Berry Cherry. Used sour cream. Deb, I really think this is the best crust I’ve had and I love how casual it looks. Just took one out of the oven that I used whole wheat white flour with nectarines and blueberries. (But I committed the cardinal sin of using the food processor; bad tendonitis!) I can’t wait to try a savory with the tomatoes in the garden. Thanks so much. I used frozen berries in the first two without a problem. 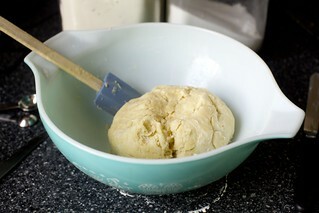 My dough seems to be dry – to the point of not mixing – and I have to add water. Idk if I am doing something wrong or I am just expecting something I ought not be expecting? Also wondering how to avoid having cornstarch on the top of the fruit that is seen in the middle. They come out beautifully and that little bit of white on the fruit just seems a shame! I have to say, I have been at least doubling the fruit! Hopefully this justifies my belief that this is absolutely a valid breakfast! If you feel bad about the sugar, cut it back some. It doesn’t seem to ruin it! Can you use thawed berries instead of fresh? Audrey — I don’t see why not. Just be sure to drain them well, to be safe. Just made this with blueberries and apples. The main galette took much longer than I expected – almost an hour total. But I made some minis as well with leftover crust and filling, and those were perfect at 30 minutes. Wonderful recipe! Been on a binge making Blackberry pies but I’m going to try galette’s. Like the crust and filling ingredients. We have fresh blackberries all year here in Costa Rica. I made this today with strawberries and it’s so pretty! I cut out the pentagon for the star shape, and used the leftover dough scraps to make rustic stars about 3″ across that i baked separately and garnished the side of the cutout area of finished tart with. Love this! I came across this recipe while looking for a way to use up excess strawberries and blueberries. It came out so pretty and delicious! So easy too. we bought a house that has not one but two sour cherry trees, so I was picking them yesterday and today, and the tree is still completely covered with them. Made this galette with the cherries, the dough was sublime. I think I will leave out the lemon juice next time though, as the filling was a bit too wet. Trying the sour cherry compote next. And if you can provide a suggestion on how to modify the blackberry yogurt popsicle for sour cherries, I will be so grateful! Does anyone know how long these might last? We are making a trip to a cabin on the fourth and am hoping to make these tomorrow (the night before)! I don’t want the crust to get soggy or anything. Any thoughts? Anyone used a frozen gluten free pie crust for these? Think it would work? OMG! I’m eating a slice, just out of the oven, with a scoop of ice cream. It is divine!! Mine did not hold it’s shape, think I didn’t pinch the inside corners, but I don’t care….sooo good! Living in Texas, I can make the star version all year long!!! I made this for a family gathering today. It was a big hit. We are going to friends tonight and I am making one more. At my husbands request I am adding a layer of cream cheese which I will mix with powdered sugar to the galette. He would eat cream cheese at every meal if possible. Thanks! Holy smokes, Deb! You aren’t messing around with this galette! It is absolute perfection! That crust….it’s rich and thick and crunchy yet chewy and everything you long for in a pie but didnt dare to hope for. Thank you! Thank you! ah, once again, a smash hit, not too sweet (I used peaches), ample, forgiving — to rustic-ify it I substituted 1/4 cup of blue cornmeal to the dough, per maybe one of your rhubarb galettes?, and oh, delicious. my son, 4 and a soccer fan, saw the star shapes and asked if I could instead do the shape of “number 10”, so thanks for creating THAT monster. much appreciation again! and again! for Valentine’s Day breakfast right now, to accompany your baked eggs with spinach & mushroom and a pan of thinly sliced roasted potatoes. My crust is chilling in the fridge and I can tell it’s going to be thick, buttery, and amazing. Thanks for making our family’s day. This was fabulous! I used cherries. Didn’t have cornstarch, so instead put in a couple of TBs of flour and also a couple TBs of raspberry jam to firm up the filling. Worked great and no raw flour taste. Thanks! Thank you! I’ve made the blueberry and the raspberry/cherry versions. My favorite, though, is strawberry. I used sliced strawberries and replaced the lemon juice with an equal amount of balsamic vinegar. Hi! I’m wondering if anyone has tried this with the strawberry rhubarb filling from Deb’s pie?? Love galette but curious if that filling would be too soupy or needs additional time to cook therefore not a good fit for the galette? Such a lovely dessert and the crust was super flaky. On my second try, I added a little too much water to the sour cream and the dough was too wet. I recommend the drier the better. It’ll be a little crumbly and hard to handle when you’re shaping the galette, but once baked it will be the perfect crust! The links to the templates aren’t working. :( I am excited to make this! Hope the links can be fixed soon. The galette’s look beautiful! Whoops — should be fixed now. Sorry for the trouble. Would frozen berries (thawed) work in this recipe? So so so good ! I made it 3 times this week already. Blueberries, strawberries, blackberries. Vanilla ice cream or milk is a must ! The pastry is unbelievably flakey, and so easy to roll out. Thank you ! Just made this with apples, using the seasoning from your pie recipe. It was delicious and SO easy. Thanks for the brilliant use of seasonal fruit that’s just as easy as crisp or cobbler! This may very well be the easiest, most crowd-pleasing recipe I’ve ever made! 10/10 would recommend for anytime that you want to impress, but are hard-pressed for time (or energy). Only a few basic ingredients and a few simple steps, for a perfectly balanced taste profile, a classic aesthetic, and an overall inexpensive but high-quality desert. Thanks for this! I just made this today, and it was incredible!! Just complete perfection. You are truly gifted and so talented with what you do. Thank you for sharing with the rest of us! I came to your website looking for a good blueberry pie filling and was led to this recipe, worked perfectly with your all-butter pie crust recipe. DELISH. Perfect texture inside, not runny at all! I work with food for a living, and I just made your crust with sour cream because it’s what I had on hand, and it’s way way way too wet to roll out. I would say that if you decide to use sour cream, don’t you ANY water. 3T was a mistake. Can we all take a second to appreciate your very witty and exceedingly unique writing style, especially when it comes to food? I find myself laughing out loud with almost every post I read because your observations are so on point and refreshingly real. “You can totally wait until the last minute to make one, as you were going to anyway” IS ME. Every. single. time. So thank you for this fantastic recipe that will only encourage my inner procrastinator and for creating content that always makes my day. 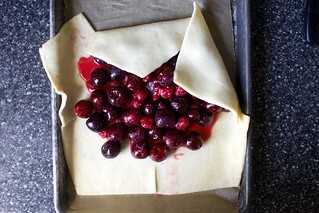 So, I LOVE this-BUT, the juices from the berries always make this unbearably soggy/stuck to the parchment paper. I’ve tried adding graham cracker crumbs to the bottom, but didn’t do it. Please help! Drain off the fruit a little before adding it next time; I don’t always, but if there’s a lot of excess liquid, I might. Could you use kefir yogurt in the recipe? We’re having friends over for dinner, but I want to make this early in the afternoon. Is it best to just bake it ahead of time then warm up before serving? Or can I assemble it a few hours ahead then bake 30 minutes before dessert time? I make one and put it on the cookie sheet and then when I was ready to bake it, I put it straight from the fridge into the oven, and it turned out great! Either works, as does serving it lukewarm or at room temperature. How many servings per galette? Grazie mille. Great recipe! I made these yesterday and subbed peaches for one of them. I also doubled the pastry recipe and had enough ‘scraps’ to make a 3rd traditional galette, which was a really nice surprise! The dough was flaky and flavorful with the lemon zest. I used greek yogurt instead of ricotta and it was really nice. I would highly recommend the recipe! Good job! Perfect recipe. I did cherries, and I wouldn’t change a thing. I’m new to working with dough, and this one was fabulous! Can I use this galette dough for a double crusted pie (if I double the recipe)? I wouldn’t, I find it too tender. I’d use it for the lid, maybe, but under the liquid, it doesn’t hold up as well as a standard dough like this. Has anyone tried a strawberry rhubarb galette? Suggestions for how to make the filling? I’ve definitely done it. A little more cornstarch can help, but mostly just keep it well-sealed (or be totally fine with leaks, nobody will know what’s missing) and should be delicious. My 13 year old sister made this with fresh peaches from our tree. It was one of the best desserts I’ve ever had. Oh boy. I am I in a serious blueberry phase that may or may not be related to being eight months pregnant. So I halved the recipe to make a mini (otherwise I would probably eat the whole thing myself). I used Greek yogurt and threw in a few strawberries who were on their way out. And it is PERFECT and ADORABLE. How far in advance can I make this if I am driving from NYC to Boston for Thanksgiving? I guess my real question is how long it can sit at room temp? I made one this summer, but it was gone in on very short evening. Turned out beautifully! The only change I would suggest is slightly less cornstarch for the 2 cups of cherries I used, perhaps just 1 tablespoon. Will try with blueberries next time! How far in advance do you think these galettes will hold up? We are currently planning to make blueberry pies as the dessert for a large family get-together this summer and the plan was to make them 1-2 days in advance, which would be fine for pie. BUT – these would be way easier, I’m just not sure if this soft crust will hold up as well as a pie dough would… Thoughts? I’d keep them in the fridge to help offset sogginess. Would it be crazy to use creme fraiche instead of ricotta or yogurt? 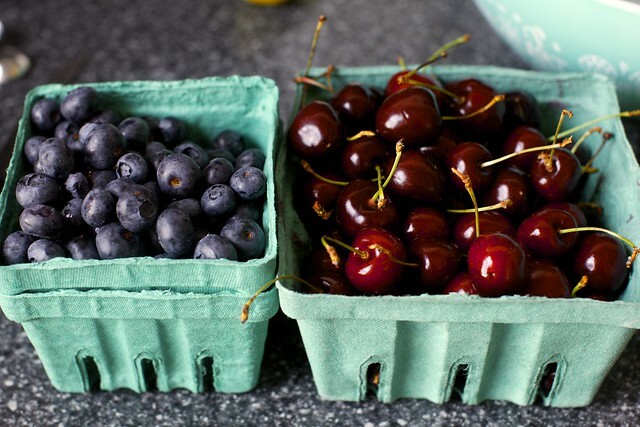 Deb–Do you use sweet red cherries or sour cherries? I love the star idea. Going to give it a try this weekend! I used sweet here. Sour would be fine, too, maybe just a teaspoon more sugar needed depending on whether they’re all or just some of the red filling. Thanks Deb! Do you think buttermilk would work in place of the ricotta? I have some leftover in the fridge. Do you have yogurt or sour cream? I prefer that here. Yes, I have yogurt. I may go for the ricotta just to try your original recommendation. Thanks Deb! Loved these, especially the crust. I made the crust in the food processor but I don’t think it effected the results. Also instead of cherries, I made a strawberry rhubarb filling for my red pie because hubby had just picked the berries and we had rhubarb in the garden. Used first of the season local blueberries for other pie. There wasn’t a crumb left. There were a perfect addition to our Fourth of July cookout and a beautiful grown up looking dessert rather than the typical flag cake. Great recipe! Very simple to make and a huge hit after dinner tonight. I had it all together and it looked perfect … and then I figured out that I had assembled it on the work space and now had to figure out how to get it onto the baking sheet! With the help of a large spatula, both hands, and a good deal of luck, I was able to maneuver it onto the baking sheet. With a little “rearranging” it was fine and even baked up looking like a star! Loved the lemon zest in the crust. I’m trying to increase this recipe for a big crowd. If I triple the recipe should I make three regular sized galettes? Or do you think I could make a massive one instead so I only have to roll and fill once, rather than three times? Thanks!! Would cranberries work or would they be too tart? Have made this a few times with summer fruits and thinking of making it for Thanksgiving.